The 2009 Mt. 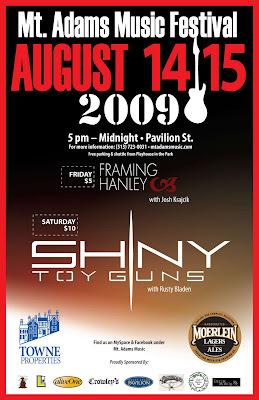 Adams Music Festival will feature performances by the Shiny Toy Guns, Framing Hanley, Josh Krajcik and much more this Friday and Saturday in one of the city's hippest nightlife hotspots. The festival (MySpace page) will kick off at 5:30pm with the last band starting at 10pm each of the nights. The $5 entry fee for Friday and $10 entry fee for Saturday will include your admission to the event and all participating bars in Mt. Adams. Thanks for the info! I was wondering when Shiny Toy Guns was going to be on stage.